According to the Insurance Institute for Business & Home Safety, the roof is the most vulnerable part of your home. Roofs protect your home from wind, rain, snow, sun, dust, leaves, and other things that can blow into your house, which is why a good roof is essential to any home. Shingles: Shingles get the most exposure to the environment because they are the top most layer of a roof. Cool shingles are highly reflective and bounce sunlight off instead of absorbing heat, which keeps your house cooler and extends the life of your roof. Even though the upfront cost of cool shingles can be more than other types of shingles, they will save you money in the long run by keeping your roof in better condition for longer and lowering cooling bills. Insulation: The type of insulation that you use for your roof can be the difference between a highly effective roof and an inefficient one. If you choose to insulate your roof, you have a choice between radiant barriers and traditional insulation. Radiant barriers are made of a highly reflective material, usually aluminum, that reflect radiant heat which keeps the entire home cool. A small layer of modern radiant barrier can replace the need for several feet of thick insulation. Ridge-line Ventilation: Last, but not least, ridgeline ventilationcan save your home a lot of energy. Ridge ventilation systems allow hot air and moisture to escape from the attic which can cool your house up to 20 degrees. This means that your home’s cooling system does not have to use as much energy to cool your house, or may not even be necessary at all, which can lower your bills drastically. More importantly, your home is much more comfortable during the warmer times of the year! Felt Paper: Roof underlayment is the waterproof first layer of roofing that goes under the shingles. There are two types of underlayment– organic felt and synthetic underlayment. For many years, organic felt was the material that most installers reached for because of its easy installation and low cost. However, synthetic underlayment became the more popular choice because it is 6 times lighter than traditional felt paper and 3 times stronger. Because of its UV coating, synthetic material can be left in the sun uncovered for up to 180 days and it won’t rot, buckle, or crack as easily as organic felt paper. 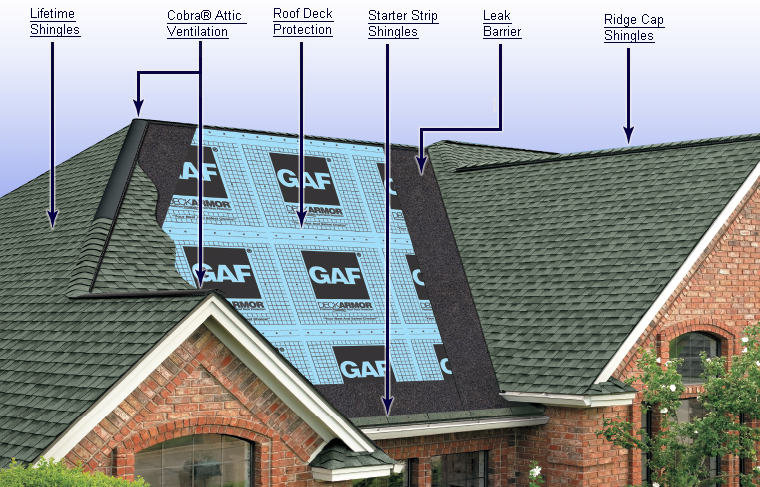 The GAF Roofing Corporation adds that synthetic underlayment prevents wind-driven rain, provides an extra layer of protection, lays flatter and helps reduce blow-off! Nails: The nails hold a roof together, which is why they should be high quality. The two types of roofing nails are electro-galvanized and hot dipped galvanized nails. Electro-galvanized nails are thinner than hot dipped galvanized nails and have a smooth, shiny finish. They are unable to withstand corrosive materials such as salt water, and are prone to rusting. Why use a nail that rusts? On the other hand, hot dipped galvanized nails are 10 times thicker than electro-galvanized nails and are dull and grainy. They can withstand corrosion much better than electro-galvanized nails due to a thick zinc layer and hold up against rust. Warranty: Finally, the most important thing to consider with any new roof is the warranty. A modern, top quality roof should be the only roof you ever purchase for the home. Manufacturer warranties should cover both the material and the workmanship for at least 25-50 years. If you have more questions about roofing or would like to speak to a home improvement advisor, call us at 866.722.3415.